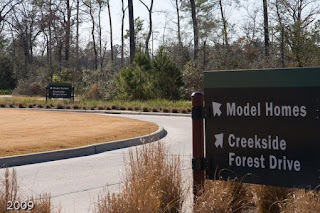 The Woodlands Commentary: Village of Creekside Park - Forest Disappearing? On a casual drive, looking at the homes, neighborhoods, and plans for this new community, one gets the impression that this Creekside Park Village will have very few homes with many trees after construction is completed. The truth? History, the county, and utility companies have laid out constraints that have caused a large loss of trees from this land. The developer's vision continues to be one consistent with The Woodlands as a whole. However, in general, we will not see much of the forest on these lots for many years. 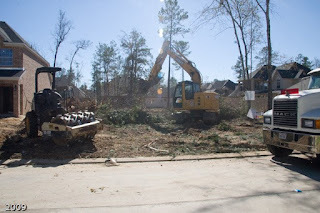 Harris County plays a significant role in minimizing the tree population on the builder's lots. So does Centerpoint. So do the builders. By the time one takes away the trees for the builder's workspace, the dry easement, and the wet easement, there are not many trees left to protect on any given lot. You can draw your own conclusions by driving through the neighborhoods. At the beginning of my quest to understand the loss of trees in this village, even though I have high respect for the development company and its employees here, I had developed a negative view of the new village in regard to the developer's commitment to the vision. Yet I knew there was much I did not understand. So I went out looking for answers. I asked myself, "what is the development company doing with this land?" It is "deforestation" to me. Now, I have a more moderated view, with some future hope, after being given insight by the development company on how this issue has played out over the past couple of decades. History of the older villages also provides a glimmer of hope for the future of the forest in this village. Water flows downhill towards the eastern end of this village, from Kuykendahl to Gosling. As I have stated before, this is due to the elevation trend that you can observe on Google Maps between 2978 and I45 throughout The Woodlands. In the new village, because of Spring Creek, the developer has had to build totally new facilities, including the water treatment plant that is located on the east side of Gosling. This is the basic reason why the village is being built starting in the east, progressing towards the west. Infrastructure is being extended west as homes occupy lots in the east. The developer is essentially working uphill, away from the water plant. It is normal to build a water processing plant on the downhill side of a development, where there is a natural runoff away from the development. It has to conform to county or state regulations. In the case of this village, the plant and water runoff is designed to exit to Spring Creek and goes beyond those standards, filtering and diluting the water through the forest preserve and oxtail before it arrives downstream on the creek. 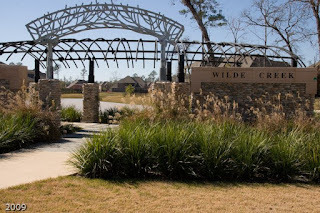 Creekside Park automobile mobility was initially designed to be conceptually the same as the Montgomery side of The Woodlands, with a four lane "highway" to move people east and west, similar to Woodlands Parkway. Then, on review of the plans by executives of the development company, the plan was changed to have two roads instead of one, with a roundabout to access those roads from Gosling. So was born the two existing thoroughfares of today. This decision occurred after the Creekside Forest road bed had been cleared as a four lane road, and the infrastructure had been laid next to the proposed roadbed. So you can see one reason why there are no trees close to the actual road and utility poles so far away from Creekside Forest Drive. To prepare the infrastructure for development, the company decided to invest in a 500-year flood plain instead of accepting the 100-year flood plain for housing development. Actually, all the property has always been well above the 100-year plain. To have a 500-year flood plain, considerable land fill was required in the eastern side of the property. One to five feet of additional dirt had to be added over the existing ground surface to bring the elevation up to a 500-year flood plain. That much dirt over existing tree roots will kill the trees, and to level the land, existing trees could not be retained. Therefore the trees had to be cleared. This area of the village was the first to be developed. Many of the existing homes were built on this dirt. It wasn't a simple arbitrary decision to elevate the ground in this area. In 1994, the "Flood of Record" occurred. It was our Noah's Flood, the greatest flood known to us in this area. "All of the properties are and have been well above the 100-year flood plain", says Fred LeBlanc. The entire eastern section that fell below the 500-year flood plain was under water during this event. To protect residents from a repeat flood of this magnitude, the eastern side had to be elevated. The elementary school is also in that area, as well as Fleming Park, YMCA and other non-residential facilities. 20-foot trees in rows on western side of property, planted by the development company in the mid 90's. To further complicate the tree issue, previous owners of the property logged all the large pines on the eastern side in the 1980's. They left the hardwoods behind. On the western side, there were two other properties primarily used for cattle grazing. Some 350 acres were pure pastureland. Those areas did not have much timber as you can imagine, so the development company planted 100,000 trees in rows as we can see today. Now, these trees are about twenty feet tall. "That was frustrating", stated Fred LeBlanc, Project Manager of Creekside Park. We planted those trees and a drought came right behind us to kill them. So we replanted again the next year and still had a problem with the drought. Finally we were successful in the third year." 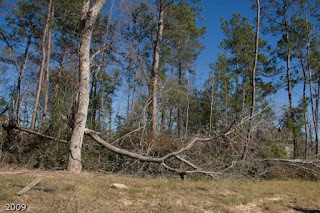 In addition, remarked Bill Kendrick, Director of Landscape management, "there were also natural forest clearings and in those places where there are or were large hardwoods, the canopy and root system covered some 50 feet, and were so large that they could not be retained for home construction." Logging without reforestation by the original owner did limit the options for development and those large hardwoods over the years, upsetting the forest balance. Normally, pines grow close together and produce a dense forest with other smaller trees and bushes filling in under the canopy. Especially prevalent here are the Yaupon. You won't find much Yaupon on developed home properties in this new village. Additional small ranches were purchased and they also were unbalanced, without much natural forest to retain. 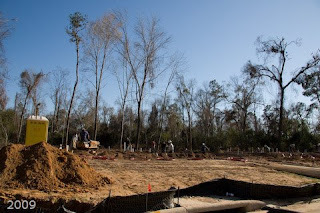 There are resident lots with many trees, but most of the trees will not remain after the builder clears the lot for construction. Consider the builders' issues. Centerpoint, the only electric company in that village, requires a 7-foot easement in the back of each home site, or a 14-foot wide easement for two back-to-back home sites. They do not allow any exceptions. Many trees are simply doomed in the back of each lot. The easement has to be cleared for every home site. What a disappointment for a utility company! They require this 14 feet and only use 7 of it at most. As Bill Kendrick put it (paraphrased), "we could put 7 feet to good use for conserving trees behind almost half of the homes, if only Centerpoint would yield to this issue." Maybe there remains an opportunity to jump on Centerpoint about this issue. 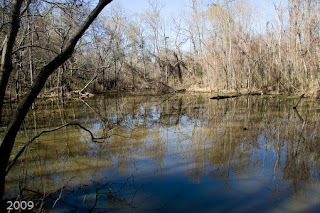 Harris County also has stricter requirements for wet easements than does Montgomery. This is a problem with having a diversity of ecology and soil within one county and trying to fit everything into a one-size-fits-all solution. This village is not in the salt grass gumbo prairie; it is in the clays and sand of the east Texas forests. Builders are under certain constraints to protect what they are able to protect. They also have discretionary rights to remove brush and smaller trees, often at the discretion of the buying customer. They will clear everything five feet from the house footprint. When you see the scaffolds, you understand why that is the case. They must also clear the easements. In any uncleared space left, they must keep the large trees. Each lot is independently cleared to retain the trees that can be retained. It would be much less expensive to clear out an entire block of home sites, but each is treated independently at a higher cost to the builder. "It costs twice as much to do it as we are doing it, instead of using conventional means to clear development lots", states Fred LeBlanc. "I am a tree hugger", says Joel Deretchin, who is in charge of designing the parks. Mr Deretchin is looking forward to a new park in the village that he is designing now, with an East Texas farm theme. The new park will be inspired by what the development company found on their property from one of these East Texas farm owners. There was a well built beautiful log cabin on the premises. A few people attempted to relocate it but were unsuccessful. It is also inspired by the general Texas historical theme in the park system of this village. "We had such beautiful huge trees in Wilde Creek Park and then ... Ike came and blew them down", remarked Mr Deretchin. Regardless, Wilde Creek Park is beautiful with its lake and fountain. As a team, Joel Deretchin and his co-workers planned and built the new Fleming Park, retaining as much original vegetation as practical, considering the elevation issue and the required additional dirt. 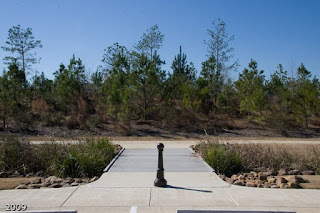 They made the landscape more interesting by sculpturing the fill dirt, and planting many pines in some areas and a variety of other native species in other locations in the park. 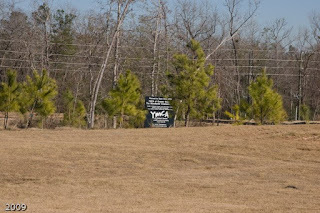 Future YMCA is located across from the park. This sign is set back from the road because of the roadbed design. 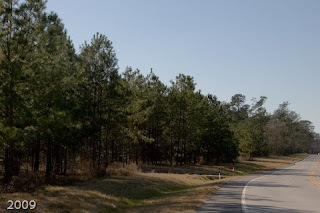 Reforestation should occur over the years all the way down the roadway but needs to be enriched with additional soil before reforestation can occur. Village landscaping is not complete by any means of the imagination. There is substantial planting needed. Time is required to build up a top layer of fertile soil for natural processes to begin. This is one reason that Creekside Forest Dr remains bare. Plantings have begun along West Wilde Creek Dr, Creekside Green Dr, several other streets and various cul-de-sacs. These plantings are part of the continuing effort to reforest the area. "Seedlngs left over from Arbor Day are being planted in the village. 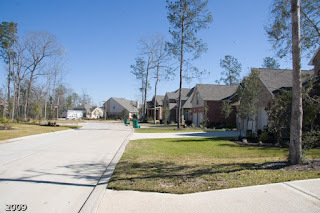 ", noted Bill Kendrick who went on to say, "Certain areas look bare, but I remember areas looking bare in the older part of The Woodlands also during development. For example, one could see McCullough School from the Woodlands Parkway in those days, same for the Panther Creek Shopping Center. Today, they are hidden from the road by the forest." There are a number of successful examples of reforestation over time lapses. This same evolution is expected to occur in the new Montgomery county village as well. To improve on the current home site reforestation, there are a few strategies in place for the home lots. 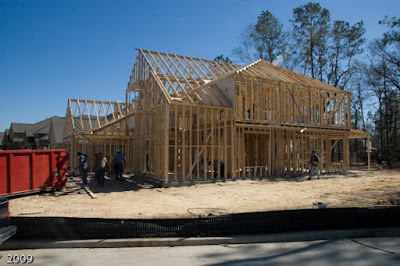 Builders are required to place (or have) three trees with a caliper of three or more inches in each front yard. Retention of existing trees in the front and back is a priority for builders. This of course sounds good, but is it really happening? My observation is that it is not, at least on a consistent basis. I don't count three trees in the front yards. I drive by homes being built in the neighborhoods with undeveloped lots covered in trees, yet no trees are found on adjacent lots being developed. I hope there is some sort of consequence to the builder if the builder fails to do his part in conservation and reforestation. As far as the Yaupon goes, the development company understands its value in the long run, but new homeowners tend to not appreciate them. It is simply brush to be removed. Here in The Woodlands, many believe the Yaupon is the most important tree here. Bill Kendrick agreed with this. He said "once I was asked what the most important tree is here in The Woodlands. I had to think about it for a minute. I responded, the Yaupon because it hides that which we do not want to see from public places." It is indeed the one that hides the homes from the main traffic arteries. It is the one that has winter berries that feeds the birds and squirrels and other animals. Pine and Yaupon, Yaupon and pine. They go together like love and marriage in our east Texas forests. Personally, I have an issue with clearing out of the Yaupon from under the trees to make new home construction visible from the main streets. I am sure there must be a reason, like protecting builder equipment from theft, but it takes many years to grow back Yaupon. When it already exists, I do not understand its removal. These local forests are primarily composed of Pine and Yaupon, complemented with Oak and other hardwoods. There is a balance of food and habitat for the creatures who live here and for the birds which migrate through here. I am one advocate of conservation. I call on new homeowners in The Woodlands to be the same. Plant Yaupon!!! Plant Pines!!! Take advantage of Arbor Day that the development company has traditionally sponsored for many years. 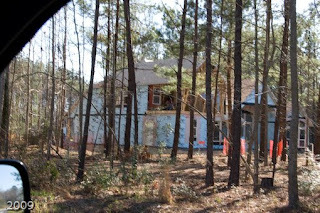 Area cleared of Yaupon under the pine trees, making house construction visible from the road. "When we were developing the Montgomery side of The Woodlands, George Mitchell would review our plans and walk through the areas and make comments as to the density of the trees and make suggestions on what to change to keep the vision as beautiful as he we could. You would have gotten along with him perfectly. ", noted Bill Kendrick. I'd like to think so. Today, we look at the plan and realize it is a very difficult chore to make a place like this live up to the name "The Woodlands". It is a vision full of values. What I found was a group of people working towards that vision, trying to overcome the many and substantial hurdles associated with such a carefully planned community. I don't want to leave this article unaccompanied by information pertinent to the general plan for this village. It is very important to recognize just how much shared green space is being provided to residents and visitors. So back to the original question. Is the forest disappearing? Not totally, but yes, of course it is disappearing. New homes built in the forest take away a large amount of land. Minimizing that impact requires sensitivity to the natural forest, not just large trees. Everyone around the table discussing this issue had similar sensitivities. I am not sure those same sensitivities exist with the builders. 10 years - Loblolly Pines will grow about two feet a year, so we will see them 20 feet taller. 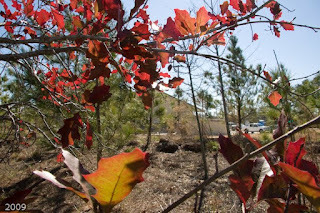 Birds have sown the seed of oaks, pines, Yaupon and various other trees about the village. There are some naturally growing small trees which have sprouted. Seedlings planted by residents on Arbor day 2009 would now be taller than humans. Wildlife is beginning to return to the home sites, because food is becoming more abundant. 20 years - There is substantial Yaupon in many locations, but most of it is small, less than six-feet high. Pine seedlings planted 18-20 years ago are now towering above houses. Those planted ten years ago are contributing to the forest landscape now. There is a diversity of hardwoods and small trees under a developing canopy. The live Oaks planted on one street now tower above and cover the lawn areas. They are producing abundant acorn crops. Any White oaks and other fast growing oaks planted as seedlings in the early years of the village are now tall and contributing to the forest canopy. 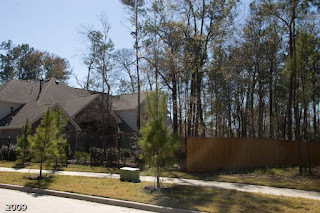 Now the homes have forest-added resale value like the rest of The Woodlands. Backyards typically have squirrels and birds. The shopping centers are no longer clearly visible from the road. Kuykendahl is four lanes and the trees planted with the development of the shopping centers are large enough to hide most of the buildings.